12019 Q50. For well qualified buyers. Special APR not compatible with some offers. Offer expires 4/30/2019. Finance for $461 per month at 1.9% APR for 72 months with $3,995 down payment. Payment expires on 04/30/19. This Vehicle is equipped with: 17" x 7.5" Aluminum Alloy Wheels, 4-Wheel Disc Brakes, 6 Speakers, ABS brakes, Air Conditioning, AM/FM radio: SiriusXM, Anti-whiplash front head restraints, Auto-dimming Rear-View mirror, Automatic temperature control, Brake assist, Bumpers: body-color, CD player, Delay-off headlights, Driver door bin, Driver vanity mirror, Dual front impact airbags, Dual front side impact airbags, Electronic Stability Control, Four wheel independent suspension, Front anti-roll bar, Front Bucket Seats, Front Center Armrest, Front dual zone A/C, Front fog lights, Front reading lights, Fully automatic headlights, Heated door mirrors, Illuminated entry, Leather Shift Knob, Leather steering wheel, Leatherette Seating Surfaces, Literature Kit, Low tire pressure warning, Occupant sensing airbag, Outside temperature display, Overhead airbag, Overhead console, Panic alarm, Passenger door bin, Passenger vanity mirror, Power door mirrors, Power driver seat, Power passenger seat, Power steering, Power windows, Radio data system, Radio: AM/FM/HD/CD w/MP3 Playback Capability, Rain sensing wipers, Rear anti-roll bar, Rear reading lights, Rear seat center armrest, Rear window defroster, Remote keyless entry, Security system, Speed control, Speed-sensing steering, Speed-Sensitive Wipers, Steering wheel mounted audio controls, Tachometer, Telescoping steering wheel, Tilt steering wheel, Traction control, Trip computer, Turn signal indicator mirrors, and Variably intermittent wipers. *Pricing is based on standard INFINITI APR.Contact us now to find out why so many customers from across the US rely on INFINITI of San Antonio, a family owned business since 1948, to meet their automotive needs!Outside of San Antonio area, no problem, we offer: Reliable, affordable and fast shipping options - Our shipping partners are licensed, bonded, fully insured & experienced with high-end vehicles.Hassle free and competitive financing options - Let us leverage our relationships with leading Banks & Credit Unions to get you the lowest rates and best terms for all credit types.Whether you're shopping for a new INFINITI or a quality used pre-owned vehicle you'll receive the same first-class experience from our certified staff of factory trained specialists.Call us today or visit us at www.infinitiofsanantonio.com. Finance for $462 per month at 1.9% APR for 72 months with $3,995 down payment. Payment expires on 04/30/19. Finance for $479 per month at 1.9% APR for 72 months with $3,995 down payment. Payment expires on 04/30/19. Finance for $492 per month at 1.9% APR for 72 months with $3,995 down payment. Payment expires on 04/30/19. This Vehicle is equipped with: 18" x 7.5" Aluminum Alloy Wheels, 4-Wheel Disc Brakes, 6 Speakers, ABS brakes, Air Conditioning, AM/FM radio: SiriusXM, Anti-whiplash front head restraints, Auto-dimming Rear-View mirror, Automatic temperature control, Brake assist, Bumpers: body-color, CD player, Compass, Delay-off headlights, Driver door bin, Driver vanity mirror, Dual front impact airbags, Dual front side impact airbags, Electronic Stability Control, Four wheel independent suspension, Front anti-roll bar, Front Bucket Seats, Front Center Armrest, Front dual zone A/C, Front fog lights, Front reading lights, Fully automatic headlights, Garage door transmitter: HomeLink, Heated door mirrors, Illuminated entry, Leather Shift Knob, Leather steering wheel, Leatherette Seating Surfaces, Literature Kit, Low tire pressure warning, Occupant sensing airbag, Outside temperature display, Overhead airbag, Overhead console, Panic alarm, Passenger door bin, Passenger vanity mirror, Power door mirrors, Power driver seat, Power moonroof, Power passenger seat, Power steering, Power windows, Radio data system, Radio: AM/FM/HD/CD w/MP3 Playback Capability, Rain sensing wipers, Rear anti-roll bar, Rear reading lights, Rear seat center armrest, Rear window defroster, Remote keyless entry, Security system, Speed control, Speed-sensing steering, Speed-Sensitive Wipers, Steering wheel mounted audio controls, Tachometer, Telescoping steering wheel, Tilt steering wheel, Traction control, Trip computer, Turn signal indicator mirrors, and Variably intermittent wipers. *Pricing is based on standard INFINITI APR.Contact us now to find out why so many customers from across the US rely on INFINITI of San Antonio, a family owned business since 1948, to meet their automotive needs!Outside of San Antonio area, no problem, we offer: Reliable, affordable and fast shipping options - Our shipping partners are licensed, bonded, fully insured & experienced with high-end vehicles.Hassle free and competitive financing options - Let us leverage our relationships with leading Banks & Credit Unions to get you the lowest rates and best terms for all credit types.Whether you're shopping for a new INFINITI or a quality used pre-owned vehicle you'll receive the same first-class experience from our certified staff of factory trained specialists.Call us today or visit us at www.infinitiofsanantonio.com. This Vehicle is equipped with: 18" x 7.5" Aluminum Alloy Wheels, 4-Wheel Disc Brakes, 6 Speakers, ABS brakes, Air Conditioning, AM/FM radio: SiriusXM, Anti-whiplash front head restraints, Auto-dimming Rear-View mirror, Automatic temperature control, Brake assist, Bumpers: body-color, CD player, Compass, Delay-off headlights, Driver door bin, Driver vanity mirror, Dual front impact airbags, Dual front side impact airbags, Electronic Stability Control, Four wheel independent suspension, Front anti-roll bar, Front Bucket Seats, Front Center Armrest, Front dual zone A/C, Front fog lights, Front reading lights, Fully automatic headlights, Garage door transmitter: HomeLink, Genuine wood dashboard insert, Heated door mirrors, Illuminated entry, Leather Shift Knob, Leather steering wheel, Leatherette Seating Surfaces, Literature Kit, Low tire pressure warning, Occupant sensing airbag, Outside temperature display, Overhead airbag, Overhead console, Panic alarm, Passenger door bin, Passenger vanity mirror, Power door mirrors, Power driver seat, Power moonroof, Power passenger seat, Power steering, Power windows, Radio data system, Radio: AM/FM/HD/CD w/MP3 Playback Capability, Rain sensing wipers, Rear anti-roll bar, Rear reading lights, Rear seat center armrest, Rear window defroster, Remote keyless entry, Security system, Speed control, Speed-sensing steering, Speed-Sensitive Wipers, Steering wheel mounted audio controls, Tachometer, Telescoping steering wheel, Tilt steering wheel, Traction control, Trip computer, Turn signal indicator mirrors, and Variably intermittent wipers. *Pricing is based on standard INFINITI APR.Contact us now to find out why so many customers from across the US rely on INFINITI of San Antonio, a family owned business since 1948, to meet their automotive needs!Outside of San Antonio area, no problem, we offer: Reliable, affordable and fast shipping options - Our shipping partners are licensed, bonded, fully insured & experienced with high-end vehicles.Hassle free and competitive financing options - Let us leverage our relationships with leading Banks & Credit Unions to get you the lowest rates and best terms for all credit types.Whether you're shopping for a new INFINITI or a quality used pre-owned vehicle you'll receive the same first-class experience from our certified staff of factory trained specialists.Call us today or visit us at www.infinitiofsanantonio.com. Finance for $494 per month at 1.9% APR for 72 months with $3,995 down payment. Payment expires on 04/30/19. Finance for $501 per month at 1.9% APR for 72 months with $3,995 down payment. Payment expires on 04/30/19. This Vehicle is equipped with: 4-Wheel Disc Brakes, 6 Speakers, ABS brakes, Air Conditioning, Alloy wheels, AM/FM radio: SiriusXM, Anti-whiplash front head restraints, Auto-dimming Rear-View mirror, Automatic temperature control, Brake assist, Bumpers: body-color, CD player, Compass, Delay-off headlights, Driver door bin, Driver vanity mirror, Dual front impact airbags, Dual front side impact airbags, Electronic Stability Control, Four wheel independent suspension, Front anti-roll bar, Front Bucket Seats, Front Center Armrest, Front dual zone A/C, Front fog lights, Front reading lights, Fully automatic headlights, Garage door transmitter: HomeLink, Genuine wood dashboard insert, Heated door mirrors, Illuminated entry, Leather Shift Knob, Leather steering wheel, Leatherette Seating Surfaces, Literature Kit, Low tire pressure warning, Occupant sensing airbag, Outside temperature display, Overhead airbag, Overhead console, Panic alarm, Passenger door bin, Passenger vanity mirror, Power door mirrors, Power driver seat, Power moonroof, Power passenger seat, Power steering, Power windows, Radio data system, Radio: AM/FM/HD/CD w/MP3 Playback Capability, Rain sensing wipers, Rear anti-roll bar, Rear reading lights, Rear seat center armrest, Rear window defroster, Remote keyless entry, Security system, Speed control, Speed-sensing steering, Speed-Sensitive Wipers, Steering wheel mounted audio controls, Tachometer, Telescoping steering wheel, Tilt steering wheel, Traction control, Trip computer, Turn signal indicator mirrors, and Variably intermittent wipers. *Pricing is based on standard INFINITI APR.Contact us now to find out why so many customers from across the US rely on INFINITI of San Antonio, a family owned business since 1948, to meet their automotive needs!Outside of San Antonio area, no problem, we offer: Reliable, affordable and fast shipping options - Our shipping partners are licensed, bonded, fully insured & experienced with high-end vehicles.Hassle free and competitive financing options - Let us leverage our relationships with leading Banks & Credit Unions to get you the lowest rates and best terms for all credit types.Whether you're shopping for a new INFINITI or a quality used pre-owned vehicle you'll receive the same first-class experience from our certified staff of factory trained specialists.Call us today or visit us at www.infinitiofsanantonio.com. Finance for $502 per month at 1.9% APR for 72 months with $3,995 down payment. Payment expires on 04/30/19. Finance for $505 per month at 1.9% APR for 72 months with $3,995 down payment. Payment expires on 04/30/19. This Vehicle is equipped with: Cargo Package (L96) (Cargo Net, Carpeted Trunk Mat, First Aid Kit, and Shopping Bag Hook), 4-Wheel Disc Brakes, 6 Speakers, ABS brakes, Air Conditioning, Alloy wheels, AM/FM radio: SiriusXM, Anti-whiplash front head restraints, Auto-dimming Rear-View mirror, Automatic temperature control, Brake assist, Bumpers: body-color, CD player, Compass, Delay-off headlights, Driver door bin, Driver vanity mirror, Dual front impact airbags, Dual front side impact airbags, Electronic Stability Control, Four wheel independent suspension, Front anti-roll bar, Front Bucket Seats, Front Center Armrest, Front dual zone A/C, Front fog lights, Front reading lights, Fully automatic headlights, Garage door transmitter: HomeLink, Genuine wood dashboard insert, Heated door mirrors, Illuminated entry, Leather Shift Knob, Leather steering wheel, Leatherette Seating Surfaces, Literature Kit, Low tire pressure warning, Occupant sensing airbag, Outside temperature display, Overhead airbag, Overhead console, Panic alarm, Passenger door bin, Passenger vanity mirror, Power door mirrors, Power driver seat, Power moonroof, Power passenger seat, Power steering, Power windows, Radio data system, Radio: AM/FM/HD/CD w/MP3 Playback Capability, Rain sensing wipers, Rear anti-roll bar, Rear reading lights, Rear seat center armrest, Rear window defroster, Remote keyless entry, Security system, Speed control, Speed-sensing steering, Speed-Sensitive Wipers, Splash Guards, Steering wheel mounted audio controls, Tachometer, Telescoping steering wheel, Tilt steering wheel, Traction control, Trip computer, Turn signal indicator mirrors, and Variably intermittent wipers. *Pricing is based on standard INFINITI APR.Contact us now to find out why so many customers from across the US rely on INFINITI of San Antonio, a family owned business since 1948, to meet their automotive needs!Outside of San Antonio area, no problem, we offer: Reliable, affordable and fast shipping options - Our shipping partners are licensed, bonded, fully insured & experienced with high-end vehicles.Hassle free and competitive financing options - Let us leverage our relationships with leading Banks & Credit Unions to get you the lowest rates and best terms for all credit types.Whether you're shopping for a new INFINITI or a quality used pre-owned vehicle you'll receive the same first-class experience from our certified staff of factory trained specialists.Call us today or visit us at www.infinitiofsanantonio.com. Finance for $506 per month at 1.9% APR for 72 months with $3,995 down payment. Payment expires on 04/30/19. This Vehicle is equipped with: 18" x 7.5" Aluminum Alloy Wheels, 4-Wheel Disc Brakes, 6 Speakers, ABS brakes, Air Conditioning, AM/FM radio: SiriusXM, Anti-whiplash front head restraints, Auto-dimming Rear-View mirror, Automatic temperature control, Brake assist, Bumpers: body-color, CD player, Compass, Delay-off headlights, Driver door bin, Driver vanity mirror, Dual front impact airbags, Dual front side impact airbags, Electronic Stability Control, Four wheel independent suspension, Front anti-roll bar, Front Bucket Seats, Front Center Armrest, Front dual zone A/C, Front fog lights, Front reading lights, Fully automatic headlights, Garage door transmitter: HomeLink, Genuine wood dashboard insert, Heated door mirrors, Illuminated entry, INFINITI Radiant Interior Ambient Lighting, Leather Shift Knob, Leather steering wheel, Leatherette Seating Surfaces, Literature Kit, Low tire pressure warning, Occupant sensing airbag, Outside temperature display, Overhead airbag, Overhead console, Panic alarm, Passenger door bin, Passenger vanity mirror, Power door mirrors, Power driver seat, Power moonroof, Power passenger seat, Power steering, Power windows, Radio data system, Radio: AM/FM/HD/CD w/MP3 Playback Capability, Rain sensing wipers, Rear anti-roll bar, Rear reading lights, Rear seat center armrest, Rear window defroster, Remote keyless entry, Security system, Speed control, Speed-sensing steering, Speed-Sensitive Wipers, Splash Guards, Steering wheel mounted audio controls, Tachometer, Telescoping steering wheel, Tilt steering wheel, Traction control, Trip computer, Turn signal indicator mirrors, and Variably intermittent wipers. *Pricing is based on standard INFINITI APR.Contact us now to find out why so many customers from across the US rely on INFINITI of San Antonio, a family owned business since 1948, to meet their automotive needs!Outside of San Antonio area, no problem, we offer: Reliable, affordable and fast shipping options - Our shipping partners are licensed, bonded, fully insured & experienced with high-end vehicles.Hassle free and competitive financing options - Let us leverage our relationships with leading Banks & Credit Unions to get you the lowest rates and best terms for all credit types.Whether you're shopping for a new INFINITI or a quality used pre-owned vehicle you'll receive the same first-class experience from our certified staff of factory trained specialists.Call us today or visit us at www.infinitiofsanantonio.com. Finance for $507 per month at 1.9% APR for 72 months with $3,995 down payment. Payment expires on 04/30/19. This Vehicle is equipped with: 4-Wheel Disc Brakes, 6 Speakers, ABS brakes, Air Conditioning, Alloy wheels, AM/FM radio: SiriusXM, Anti-whiplash front head restraints, Auto-dimming Rear-View mirror, Automatic temperature control, Brake assist, Bumpers: body-color, CD player, Compass, Delay-off headlights, Driver door bin, Driver vanity mirror, Dual front impact airbags, Dual front side impact airbags, Electronic Stability Control, Four wheel independent suspension, Front anti-roll bar, Front Bucket Seats, Front Center Armrest, Front dual zone A/C, Front fog lights, Front reading lights, Fully automatic headlights, Garage door transmitter: HomeLink, Genuine wood dashboard insert, Heated door mirrors, Illuminated entry, INFINITI Radiant Interior Ambient Lighting, Leather Shift Knob, Leather steering wheel, Leatherette Seating Surfaces, Literature Kit, Low tire pressure warning, Occupant sensing airbag, Outside temperature display, Overhead airbag, Overhead console, Panic alarm, Passenger door bin, Passenger vanity mirror, Power door mirrors, Power driver seat, Power moonroof, Power passenger seat, Power steering, Power windows, Radio data system, Radio: AM/FM/HD/CD w/MP3 Playback Capability, Rain sensing wipers, Rear anti-roll bar, Rear reading lights, Rear seat center armrest, Rear window defroster, Remote keyless entry, Security system, Speed control, Speed-sensing steering, Speed-Sensitive Wipers, Splash Guards, Steering wheel mounted audio controls, Tachometer, Telescoping steering wheel, Tilt steering wheel, Traction control, Trip computer, Turn signal indicator mirrors, and Variably intermittent wipers. *Pricing is based on standard INFINITI APR.Contact us now to find out why so many customers from across the US rely on INFINITI of San Antonio, a family owned business since 1948, to meet their automotive needs!Outside of San Antonio area, no problem, we offer: Reliable, affordable and fast shipping options - Our shipping partners are licensed, bonded, fully insured & experienced with high-end vehicles.Hassle free and competitive financing options - Let us leverage our relationships with leading Banks & Credit Unions to get you the lowest rates and best terms for all credit types.Whether you're shopping for a new INFINITI or a quality used pre-owned vehicle you'll receive the same first-class experience from our certified staff of factory trained specialists.Call us today or visit us at www.infinitiofsanantonio.com. Finance for $509 per month at 1.9% APR for 72 months with $3,995 down payment. Payment expires on 04/30/19. This Vehicle is equipped with: 4-Wheel Disc Brakes, 6 Speakers, ABS brakes, Air Conditioning, Alloy wheels, AM/FM radio: SiriusXM, Anti-whiplash front head restraints, Auto-dimming Rear-View mirror, Automatic temperature control, Brake assist, Bumpers: body-color, CD player, Compass, Delay-off headlights, Driver door bin, Driver vanity mirror, Dual front impact airbags, Dual front side impact airbags, Electronic Stability Control, Four wheel independent suspension, Front anti-roll bar, Front Bucket Seats, Front Center Armrest, Front dual zone A/C, Front fog lights, Front reading lights, Fully automatic headlights, Garage door transmitter: HomeLink, Genuine wood dashboard insert, Heated door mirrors, Illuminated entry, INFINITI Radiant Interior Ambient Lighting, Leather Shift Knob, Leather steering wheel, Leatherette Seating Surfaces, Literature Kit, Low tire pressure warning, Occupant sensing airbag, Outside temperature display, Overhead airbag, Overhead console, Panic alarm, Passenger door bin, Passenger vanity mirror, Power door mirrors, Power driver seat, Power moonroof, Power passenger seat, Power steering, Power windows, Premium Paint, Radio data system, Radio: AM/FM/HD/CD w/MP3 Playback Capability, Rain sensing wipers, Rear anti-roll bar, Rear reading lights, Rear seat center armrest, Rear window defroster, Remote keyless entry, Security system, Speed control, Speed-sensing steering, Speed-Sensitive Wipers, Splash Guards, Steering wheel mounted audio controls, Tachometer, Telescoping steering wheel, Tilt steering wheel, Traction control, Trip computer, Turn signal indicator mirrors, and Variably intermittent wipers. *Pricing is based on standard INFINITI APR.Contact us now to find out why so many customers from across the US rely on INFINITI of San Antonio, a family owned business since 1948, to meet their automotive needs!Outside of San Antonio area, no problem, we offer: Reliable, affordable and fast shipping options - Our shipping partners are licensed, bonded, fully insured & experienced with high-end vehicles.Hassle free and competitive financing options - Let us leverage our relationships with leading Banks & Credit Unions to get you the lowest rates and best terms for all credit types.Whether you're shopping for a new INFINITI or a quality used pre-owned vehicle you'll receive the same first-class experience from our certified staff of factory trained specialists.Call us today or visit us at www.infinitiofsanantonio.com. 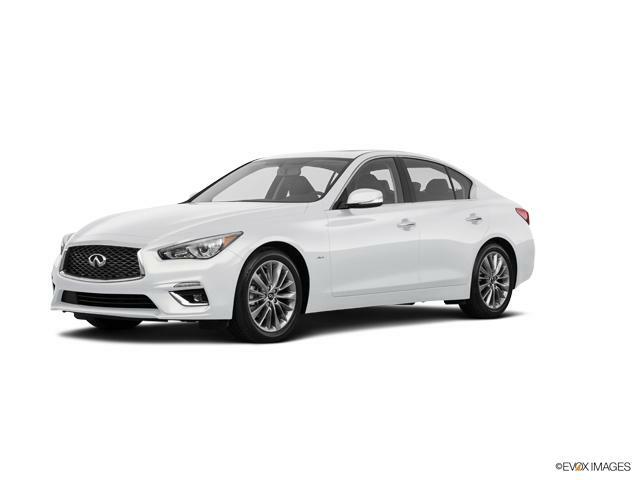 Lease the 2019 Q50 3.0t LUXE for only $299! Call 210-941-4445 to schedule a test drive today. Finance for $521 per month at 1.9% APR for 72 months with $3,995 down payment. Payment expires on 04/30/19. This Vehicle is equipped with: All Weather Package (L93) (All-Season Floor Mats and Trunk Protector), Cargo Package (L96) (Cargo Net, Carpeted Trunk Mat, First Aid Kit, and Shopping Bag Hook), 4-Wheel Disc Brakes, 6 Speakers, ABS brakes, Air Conditioning, Alloy wheels, AM/FM radio: SiriusXM, Anti-whiplash front head restraints, Auto-dimming Rear-View mirror, Automatic temperature control, Brake assist, Bumpers: body-color, CD player, Compass, Delay-off headlights, Driver door bin, Driver vanity mirror, Dual front impact airbags, Dual front side impact airbags, Electronic Stability Control, Four wheel independent suspension, Front anti-roll bar, Front Bucket Seats, Front Center Armrest, Front dual zone A/C, Front fog lights, Front reading lights, Fully automatic headlights, Garage door transmitter: HomeLink, Genuine wood dashboard insert, Heated door mirrors, Illuminated entry, INFINITI Radiant Interior Ambient Lighting, INFINITI Radiant Welcome Lighting, Leather Shift Knob, Leather steering wheel, Leatherette Seating Surfaces, Literature Kit, Low tire pressure warning, Occupant sensing airbag, Outside temperature display, Overhead airbag, Overhead console, Panic alarm, Passenger door bin, Passenger vanity mirror, Power door mirrors, Power driver seat, Power moonroof, Power passenger seat, Power steering, Power windows, Premium Paint, Radio data system, Radio: AM/FM/HD/CD w/MP3 Playback Capability, Rain sensing wipers, Rear anti-roll bar, Rear reading lights, Rear seat center armrest, Rear window defroster, Remote keyless entry, Security system, Speed control, Speed-sensing steering, Speed-Sensitive Wipers, Splash Guards, Steering wheel mounted audio controls, Tachometer, Telescoping steering wheel, Tilt steering wheel, Traction control, Trip computer, Turn signal indicator mirrors, and Variably intermittent wipers. *Pricing is based on standard INFINITI APR.Contact us now to find out why so many customers from across the US rely on INFINITI of San Antonio, a family owned business since 1948, to meet their automotive needs!Outside of San Antonio area, no problem, we offer: Reliable, affordable and fast shipping options - Our shipping partners are licensed, bonded, fully insured & experienced with high-end vehicles.Hassle free and competitive financing options - Let us leverage our relationships with leading Banks & Credit Unions to get you the lowest rates and best terms for all credit types.Whether you're shopping for a new INFINITI or a quality used pre-owned vehicle you'll receive the same first-class experience from our certified staff of factory trained specialists.Call us today or visit us at www.infinitiofsanantonio.com. Finance for $522 per month at 1.9% APR for 72 months with $3,995 down payment. Payment expires on 04/30/19. 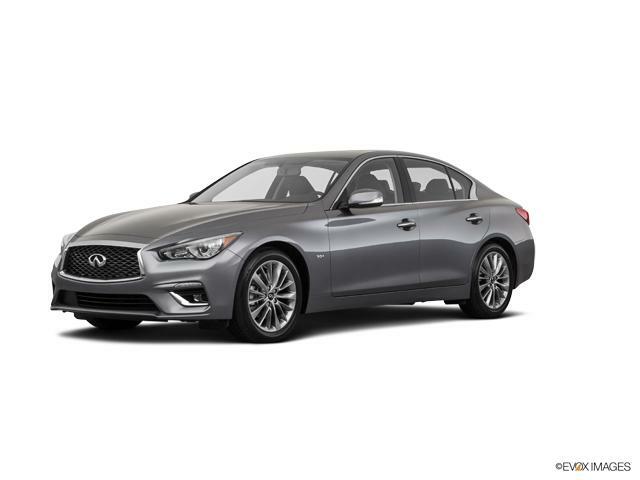 Lease the 2019 Q50 for only $299 per month for 39 months! Call 817-809-2600 now to schedule a test drive. Finance for $527 per month at 1.9% APR for 72 months with $3,995 down payment. Payment expires on 04/30/19. Finance for $529 per month at 1.9% APR for 72 months with $3,995 down payment. Payment expires on 04/30/19.